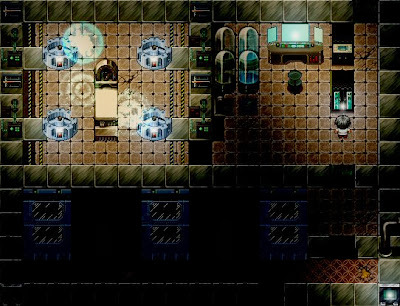 Although WOMB was made in RPG maker, it tends to play more like a horror puzzle game in space. Your name is 36D and you wake up from cryo sleep on a dark spaceship all alone, trying to remember what your mission was and attempting to find everyone else aboard the ship. As you begin your search, you start hearing a female voice that’s guiding you along but also taunting you at the same time. 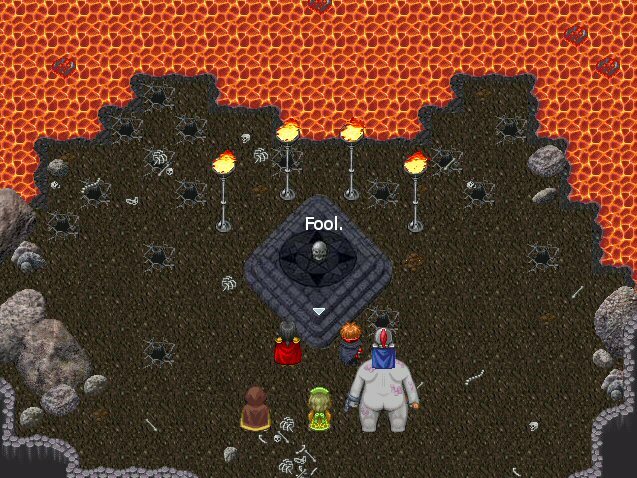 Will you find your way back home and survive, or will you go insane and die? 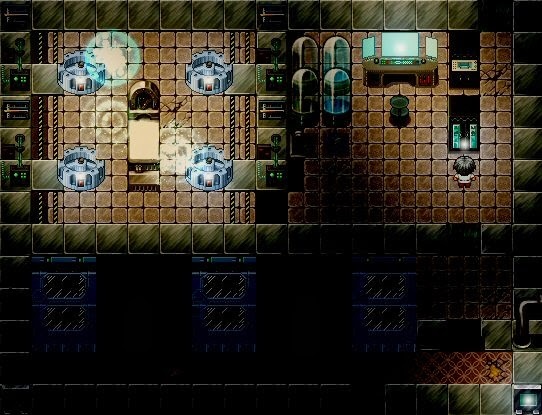 As you progress through the game, you get to solve puzzles, uncover mysteries and strange phenomena, and view various flashbacks which provide insight on the backstory. 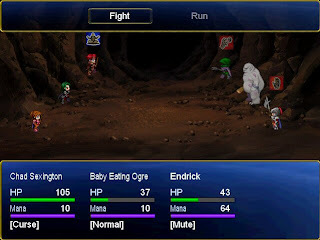 The game doesn’t feature any battles with monsters or other enemies. It is more about simply uncovering the story bit by bit and it does so very well. Intense, dark atmosphere of isolation really adds to the whole mysterious feel that the game has going for it. 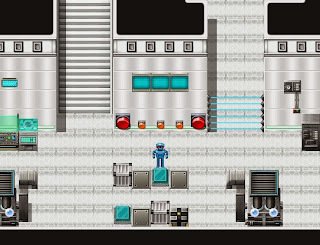 There are times when the game changes the pace a bit and introduces something new, like for example getting a chance to travel through space and mine planets for potential fuel with the help of a specialised robot. 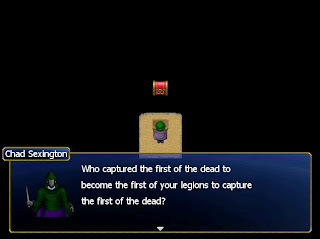 Another feature that I really enjoyed and what I haven’t seen before in other RM games is a clever placement of various video clips. 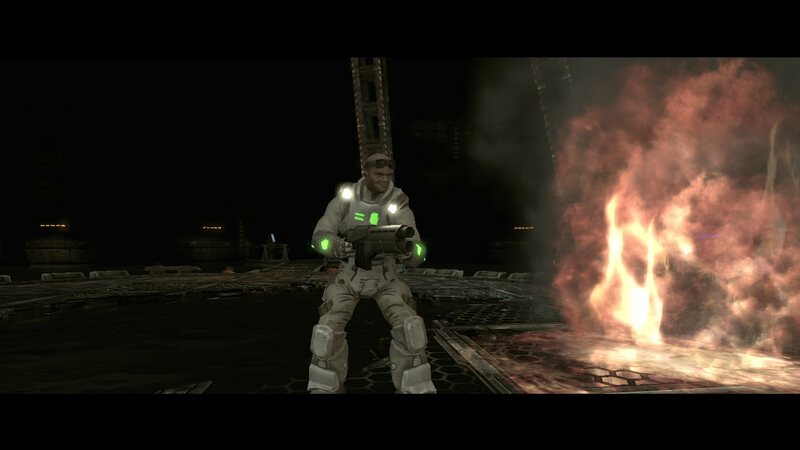 Those usually tend to play during flashbacks and key scenes and they give the game an extra bit of immersion. 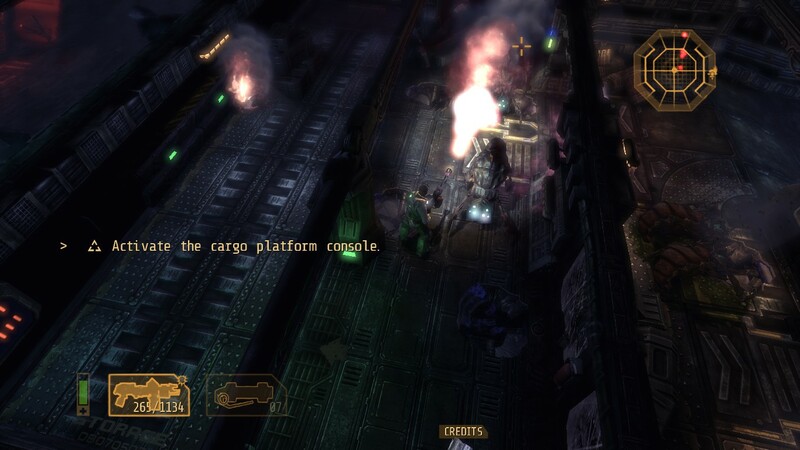 In addition to video clips, we also get to hear onboard computer voice in certain areas, which once again adds to the immersion and gives the game a more professional feel. There are some drawbacks to the game, like some passability issues, the walking speed being too slow, and at times it simply being hard to know where to go next and what to do. Sometimes it can be because of the instructions not being too clear, other times it’s simply due to most areas being too dark and it can be easy to miss doorways and other vital elements. 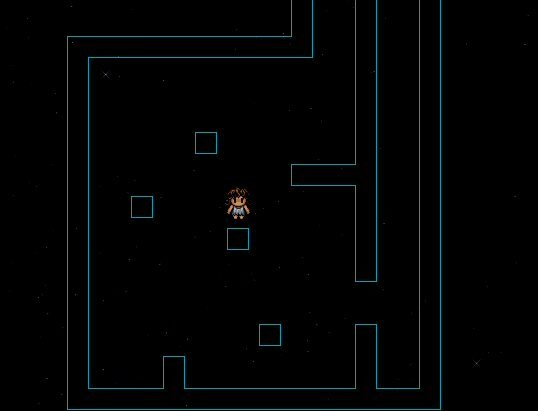 However, all in all, WOMB has an interesting, well-developed story, and most of all an absolutely jawdropping conclusion that will stick with you once you’ve completed the game. Go HERE for the iToken's website. 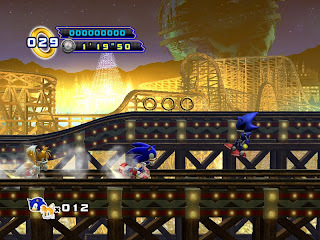 Following on from my review of Sonic 4 Episode 1, in this entry I am going to review Episode 2. At first glance Episode 2 looks pretty identical to 1 except with the sidekick Tails included. However, there are more differences between the episodes than it first seems. First of I want to mention that because this episode allows not only single player but also for two players to play, all the controls and key bindings are now different to the first episode, and so the PC controls are pretty bad. 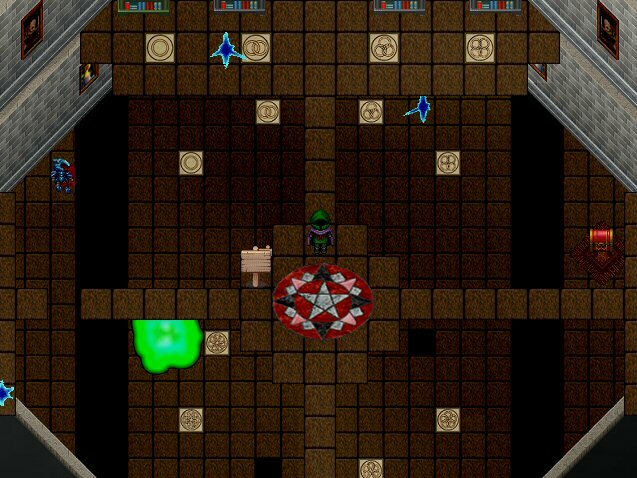 I would highly recommend to play this game with a gamepad/controller that can be connected to the PC. 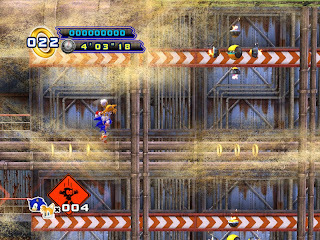 With the stages, they take on a similar format as in the first Episode – three acts and then a boss fight. At first we have the Sylvania Castle Zone. 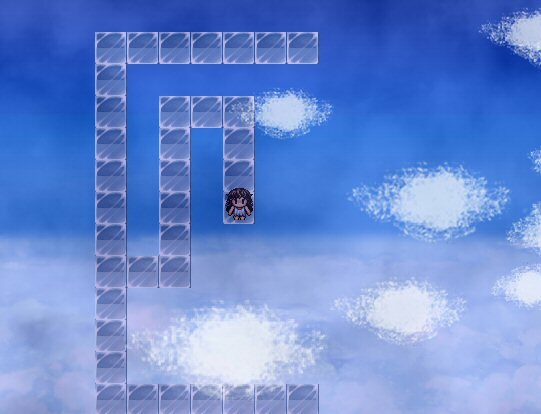 Once we’ve completed that, we get access to two more zones to play in our order of preference – White Park Zone and Oil Desert Zone, and once those two are completed as well, we can play through the Sky Fortress Zone. 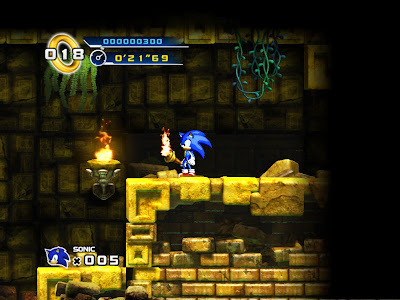 Sylvania Castle Zone quite noticeably borrows its inspirations from the Aquatic Ruin Zone (Sonic 2) and Marble Garden Zone (Sonic 3), and basically takes place among ancient ruins that have been overgrown with plant life. In the second act we get to spend some more time in the underwater parts, and the third act changes the overall look to night time. 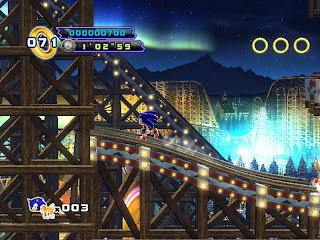 White Park Zone takes place in an amusement park in the snowy mountains. 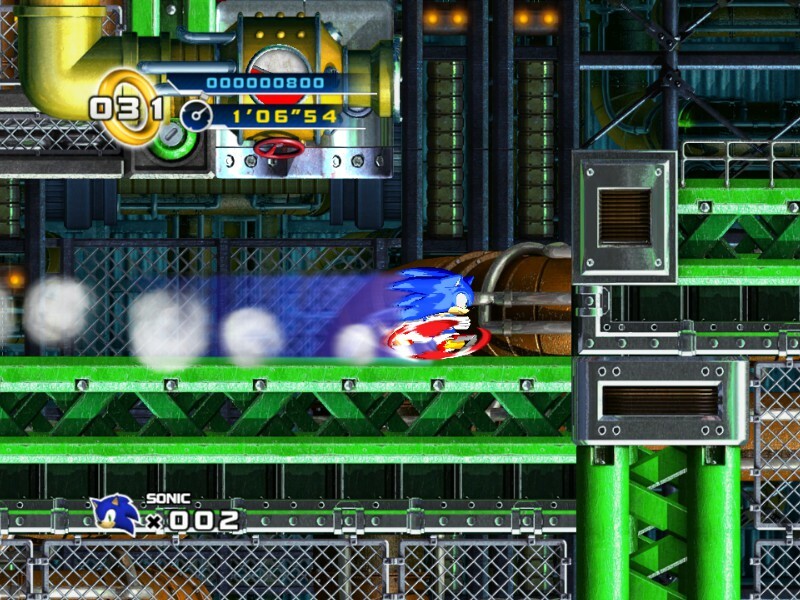 The first act here has some similarities to the Ice Cap Zone from Sonic 3. The second act is one I really enjoyed as it takes place on various rollercoaster tracks, and despite various obstacles that can one-hit-kill you, it still manages to be really high speed and incredibly fun. The third act makes you delve into the underwater parts and is much slower-paced compared to the first two acts. 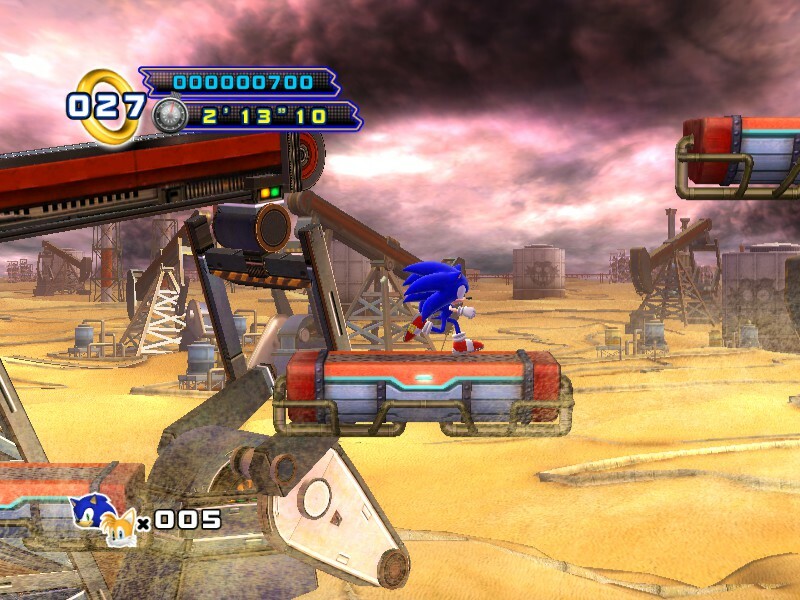 Oil Desert Zone is really stunning looking and as the name implies takes place in a Middle-Eastern-looking area. The challenges here include having to traverse the quicksands before you sink into them, sliding on oil streams, managing to get past the sandstorms, among a few others. 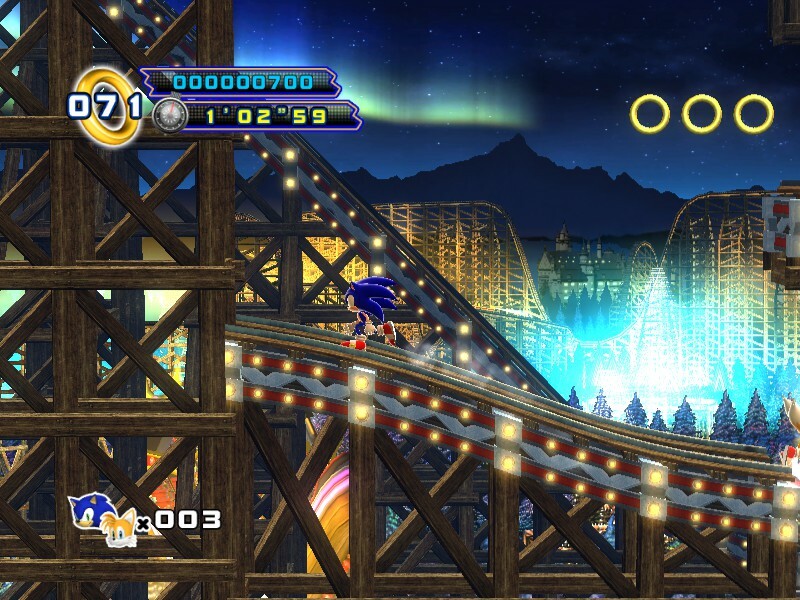 It does remind me greatly of the Oil Ocean Zone from Sonic 2, but with tonnes of changes. 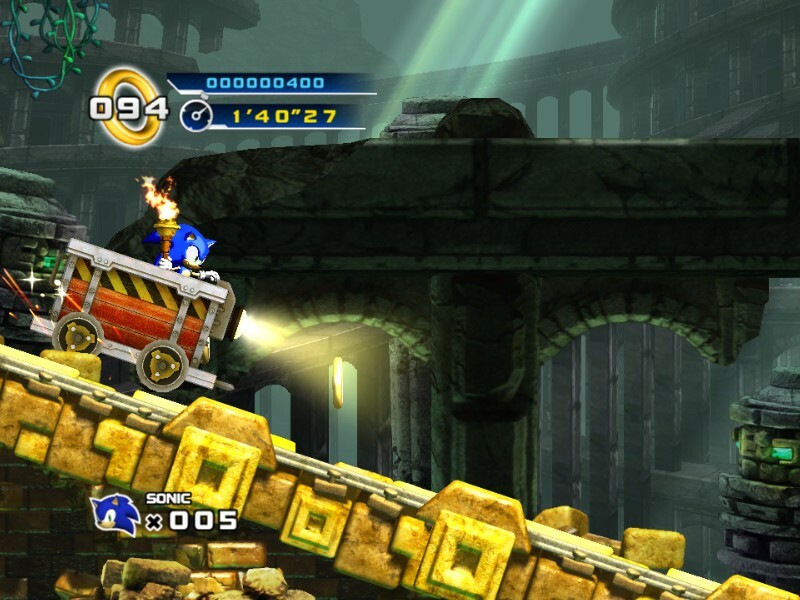 The third act in this zone is perhaps one of the hardest in the game as during some parts of it you end up inside vertical structures which get quickly filled up with sand, and your job is to climb up the structure as fast as possible or else end up getting buried beneath the sand. 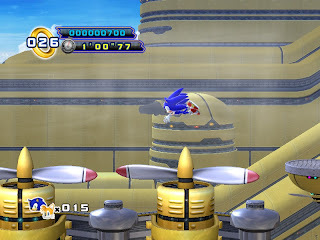 Sky Fortress Zone is, as you might’ve guessed already, very similar to the Wing Fortress Zone from Sonic 2, where we have to make our way through a giant airborne structure that’s floating in the skies. 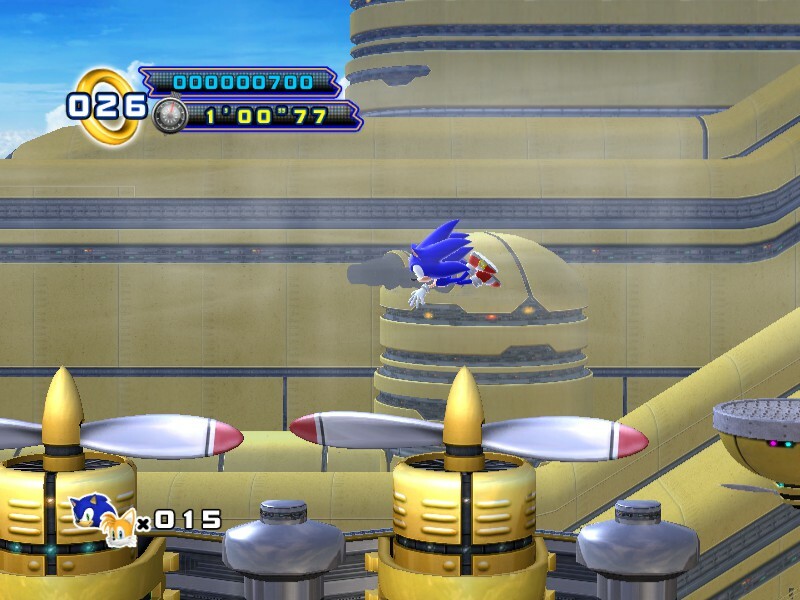 The first act of this zone has us flying aboard a Tornado airplane (just like in Sky Chase Zone from Sonic 2). 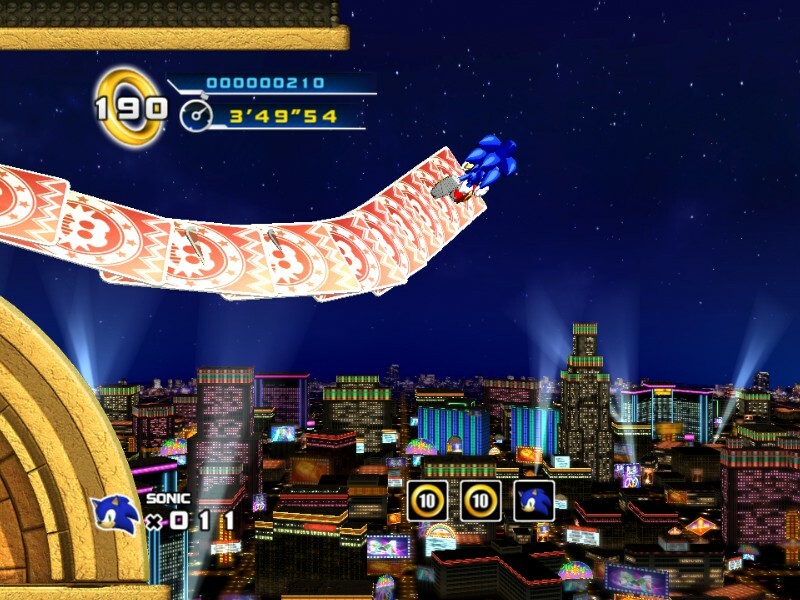 I had mixed feelings on this act since there were parts in it where you had to bounce and use homing attack on the aerial enemies, but lock-on feature not always working as intended would sometimes cause you to fall to your death. Acts 2 and 3 were a lot more enjoyable as they were pretty much the classic Wing Fortress Zone but a lot more high speed. They were definitely my favourite acts in this game without a doubt. 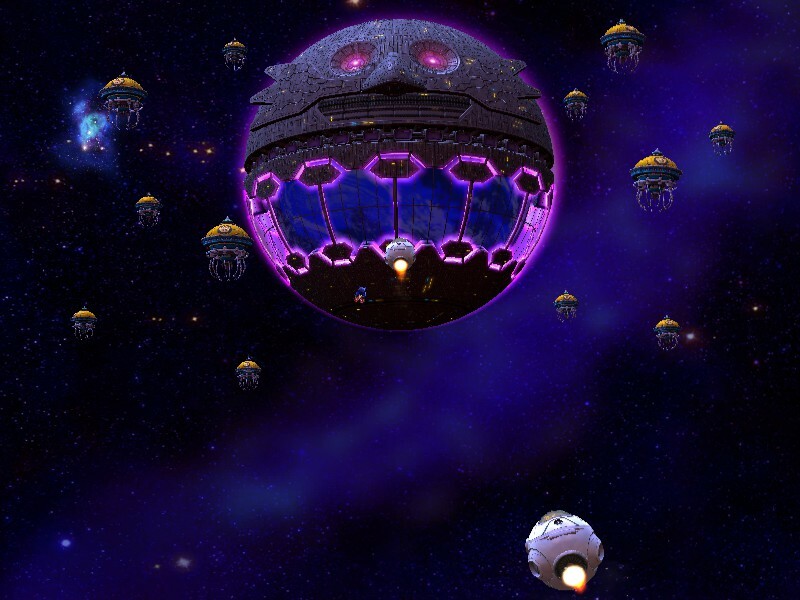 Once we’ve cleared the Sky Fortress Zone, we head to the final stage that is the Death Egg mk II. What I liked about it is that it’s been split into two parts, as opposed to bundling everything together like the first episode did. Now this is definitely not all. Apart from the stages mentioned above, we also get some bonus stages where we get to play as Metal Sonic, who is one of Dr Eggman’s creations that is made to look and act the same as Sonic. 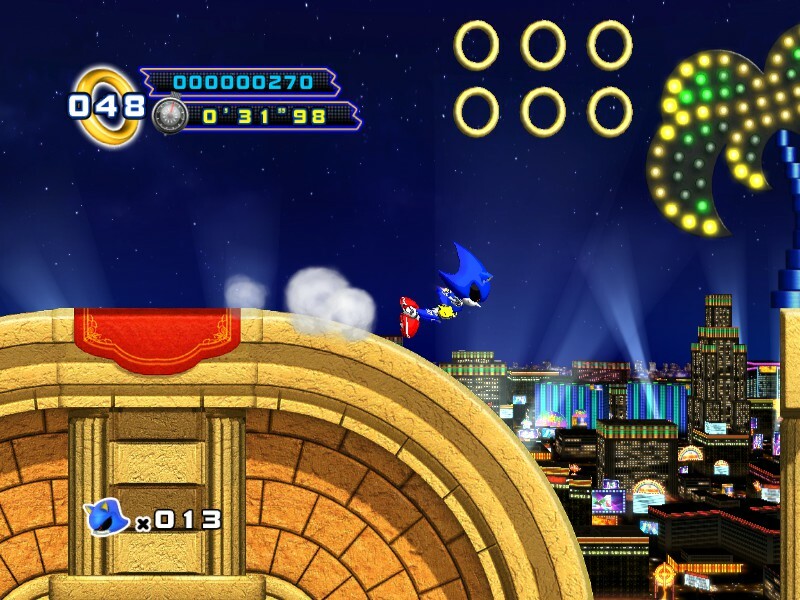 These few bonus stages are actually the stages from Episode I with a few small changes made to them. 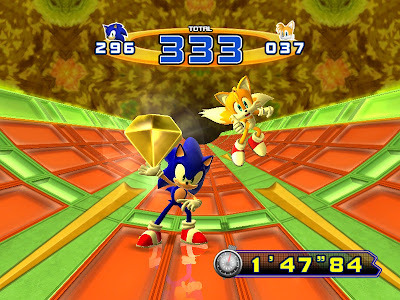 And finally let’s not forget the special stages where we get a chance to collect those elusive Chaos Emeralds. 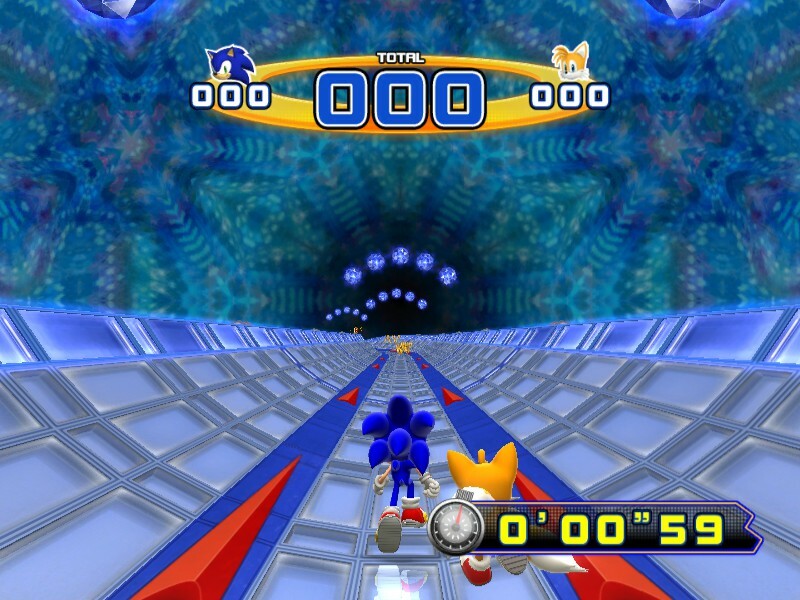 Episode I made its special stages very similar to the ones from the original Sonic game, and so Episode II made them very similar to the ones from Sonic 2, where Sonic and Tails must run through a 3D half-pipe structure and collect certain number of rings in order to get past checkpoints. I actually find these special stages a lot more fun than the ones from Episode I. 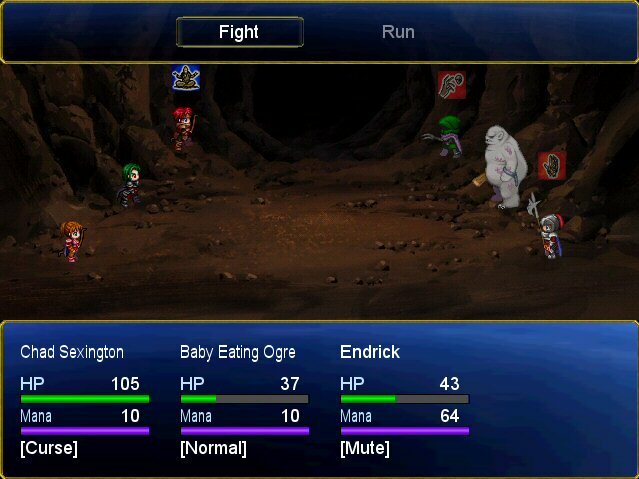 Also really worth mentioning the boss fights. Not going to reveal too much due to spoilers, but the boss fights really do shine in this game as each one of them is unique and different to all the others. I’ll admit that I wasn’t too fond of the first boss fight, but most others were great. The ones in White Park Zone and Oil Desert Zone certainly come to mind as highly enjoyable fights, and the Final Boss fight was fantastic as well. It was much better, in my opinion, than the final boss fight in Episode I. And so overall I really enjoyed this entry in the Sonic franchise. Apart from a few minor hiccups, Episode II actually does improve on many aspects from Episode I. 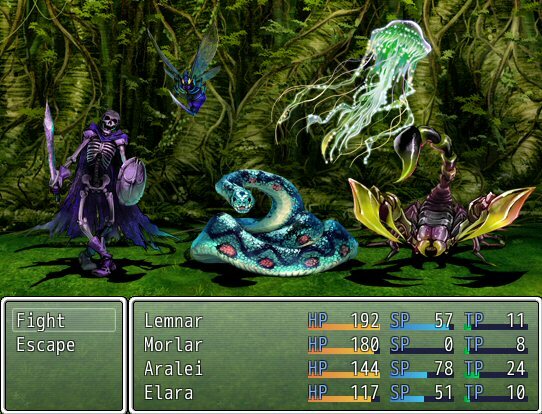 The graphics are very colourful, the stages tend to throw a variety of challenges your way, the boss fights really stand out from each other, and the soundtrack is really addictive to listen to. As far as sidescrolling platformers go, in my opinion you won’t find many better than this as it’s a really well-balanced and all-rounded game. And as a final note I really wonder what Episode III in this series will hold for us. As many would guess, it would probably have Knuckles as a sidekick. But also, seeing that most stages in these two episodes have been highly inspired by already existing stages from the original trilogy, it makes me wonder which stages will be included in Episode III. 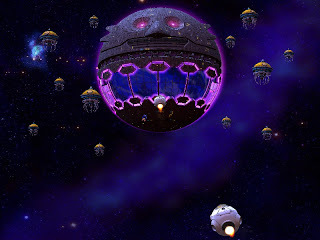 I personally would really want to see something heavily inspired by the Starlight Zone from the original Sonic. 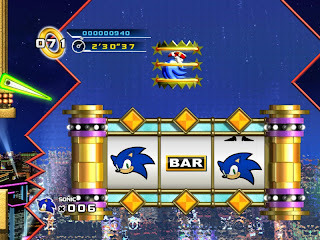 Although the Sonic franchise is huge and consists of many games, not too long ago Sonic 4 Episode 1 was released, which was intended to be not only just another Sonic game, but to be part of the original trilogy that set the whole franchise rolling on the first place back in late 80s/early 90s. Sonic 4 Episode 2 has been released shortly after Episode 1. However, this review will only concentrate on Episode 1. This game takes a humongous amount of aspects and inspiration from the original trilogy, in fact to the point that it seems it was intentional in order to provide nostalgia factor for the players. Of course that’s not a bad thing at all, especially considering that the game added some of its own twists to all of the original goodies that it included. 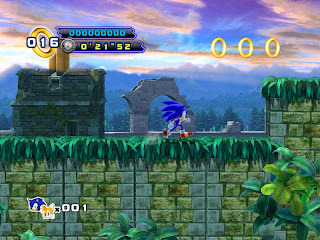 Splash Hill Zone continues the tradition of the original trilogy that always has a paradisal, grassy, waterfall-infested place as the first zone, where the player can get acquainted with the game and to generally cruise through. 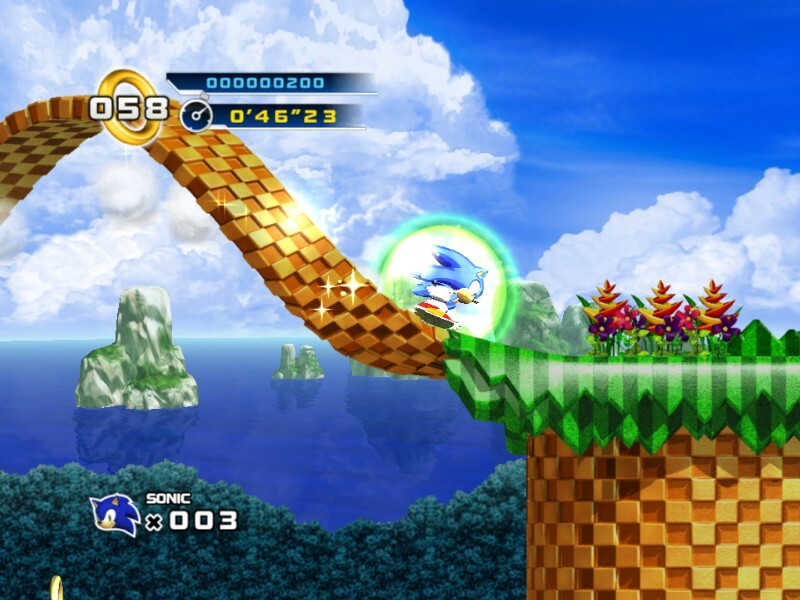 The 2nd act of this zone introduces vines which we can use to swing on, similar to the ones in the Angel Island Zone of Sonic 3, and the 3rd act has some cool, fast-speed rope-gliding happening, which can be slightly reminiscent of those sliding platforms in the Hill Top Zone of Sonic 2. 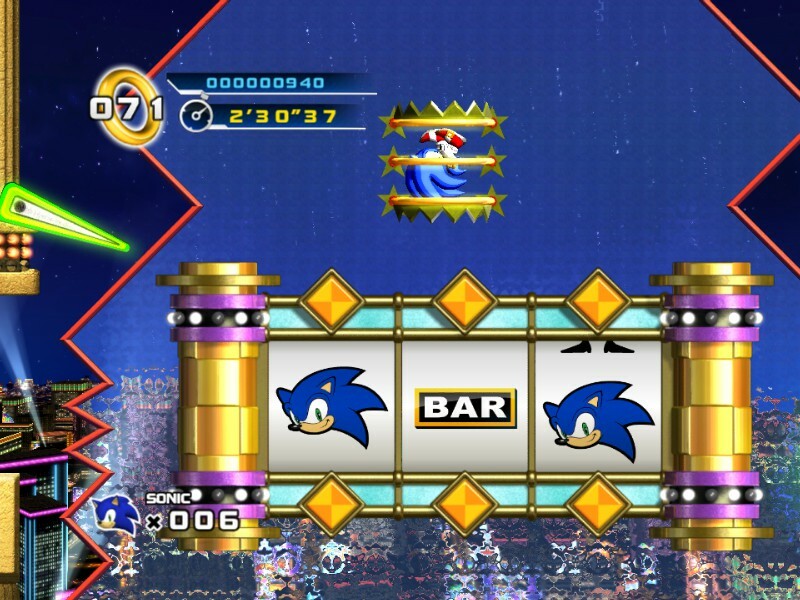 Casino Street Zone as the name implies is the same one as we’ve seen in Sonic 2, with also some inspirations of the Carnival Night Zone of Sonic 3. In this zone there’s a lot more bouncing and slingshotting around happening than in the previous zone. In act 2 of this zone we get to spend a lot of time jumping on big cards which flip around, forcing us to be quick, and in act 3, a lot of the gameplay revolves around getting inside cannons and then shooting ourselves in the intended direction in order to continue further. 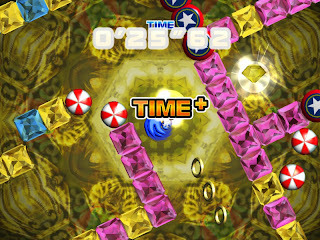 Lost Labyrinth Zone is mostly based on the Labyrinth Zone from the original Sonic, except now it looks much prettier than before. The first act of this zone has us spending a lot of time running away or balancing atop huge round rocks. The second act happens in the dark, where we must light our path with a torch and not get caught out by sneaky traps. And third act has a lot of underwater areas, which gladly is the only underwater gameplay in this entire game. 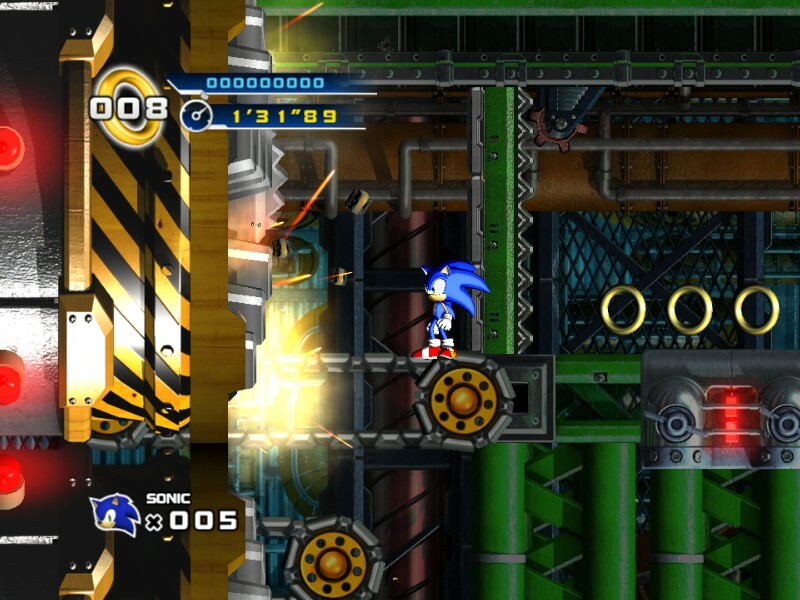 Mad Gear Zone is easily recognizable as a tribute to Scrap Brain Zone from original Sonic, and even more so to the Metropolis Zone in Sonic 2, and in my opinion it’s even cooler and more epic than before. A lot of the stuff from those zones returns in Mad Gear zone, including spinning gears, heavy compressors, conveyor belts, and other mechanical obstacles. 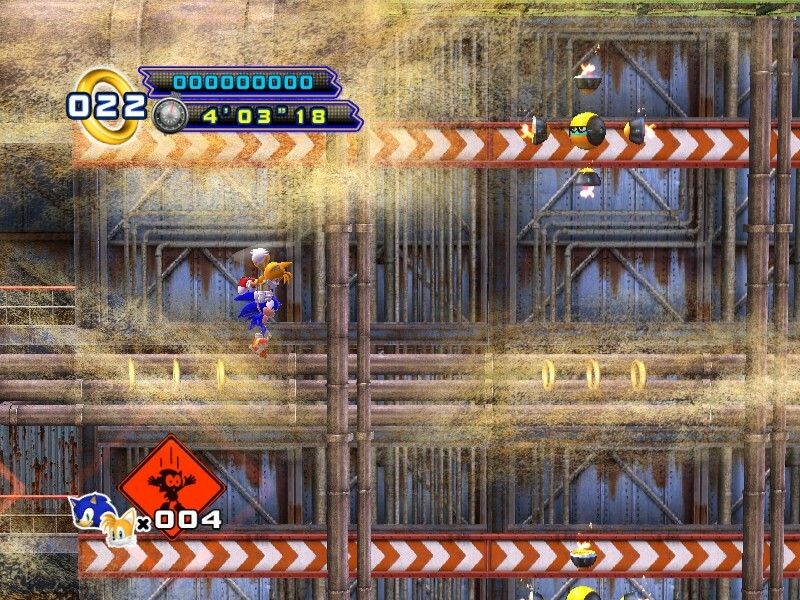 In the 3rd act of this zone, which is probably my favourite act in the entire game, for most of the time we are being chased by a huge machine, which has a single purpose to flatten us into a pancake, but whilst running away from it we still have to avoid other obstacles, what really forces us to act quickly and on the spot, and at the same time letting us breathe a huge sigh of relief once the act is complete. Once the bosses in all 4 zones are beaten, we can access the final stage, which is the Egg Station Zone. 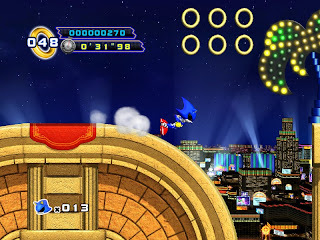 Unfortunately I found this zone to be kind of disappointing because before you get to face Eggman in his final form, you have to fight him in his previous 4 forms again, except now we just have to do them in a row, one right after the other. 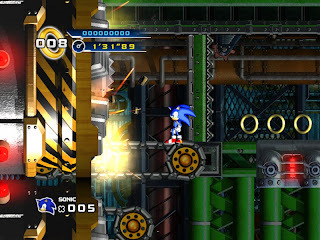 Throughout the game we can also access the special stages, which play a lot like the ones from the original Sonic, where Sonic traverses spinning maze-like structure in order to get to the emerald at the end. 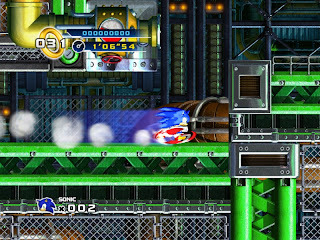 What’s different this time round, however, is that we get to spin the maze ourselves in order to guide Sonic, but there is a time limit, so we must be quick about it. Perhaps one criticism that I’ve seen being mentioned by many other players of this game is how the control is a bit strange, and I’d have to agree to it. Unlike the original trilogy where Sonic has a lot of momentum when running and jumping, this time round, if we let go off the direction button midway through the jump, then Sonic instantly starts to fall down as opposed to continuing to fly in the same direction. It is a bit of an annoying mechanic, but it is something one can get used to fairly quickly, not to mention that a new addition of homing diving attack when in midair makes the gameplay pretty fun. For the most part I’ve really enjoyed Sonic 4 Episode 1. Although the overall game isn’t overly long (~ 5 hours or so), each stage has been given a lot of detail and attention, and some new gameplay mechanics can keep the experience quite fresh in each new stage. 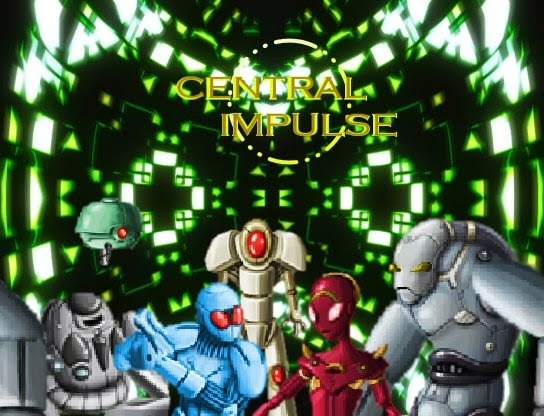 Sure, this game does not surpass the originals, but I think it really deserves its place amongst them. After enjoying the first game, I went straight to the second. 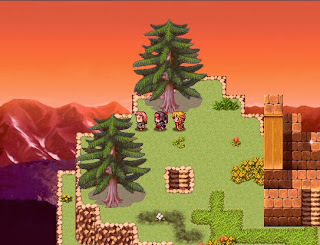 Although the games are quite simplistic and have a basic formula, they are fun. 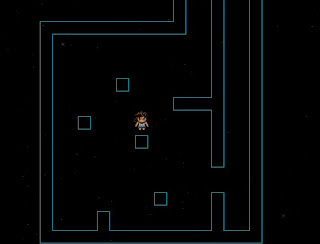 You walk through eerie dark corridors most of the time and shoot alien bugs. I was, however, sort of disappointed by the fact that this second instalment didn’t really introduce anything new to the series and is more like Alien Breed 1.5 than Alien Breed 2. The environments are exactly the same as in the first game. I was hoping there’d be something different in that regard. 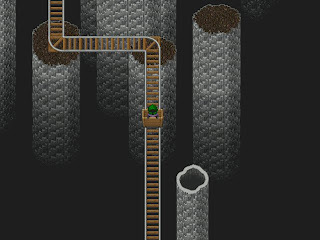 Maybe an outside level for once? Or at least some noticeably different textures to the ones we’ve seen the entire time. 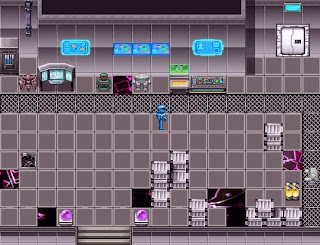 And just as in the first game, the entire story revolves around simply going from one sector of the ship to another and activating various systems. I know it’s not the focus of the game, but still, a little more variation would’ve been nice. Plus also they overdid it on those alien eggs. I got sick of shooting them partway into the game. And way too many human corpses to loot too, which all require you to hold space and waste time rather than playing the game. We still have 5 weapons, just as in the first game, except two of those are different. The first three (Assault rifle, Shot cannon, and Flamethrower) are still there, but the Laser Rifle and Ion Spike have been replaced with a Hyper Blaster (a heavy minigun-like weapon) and a Rocket Launcher. Not sure what to make of this change as I think the older weapons were better. 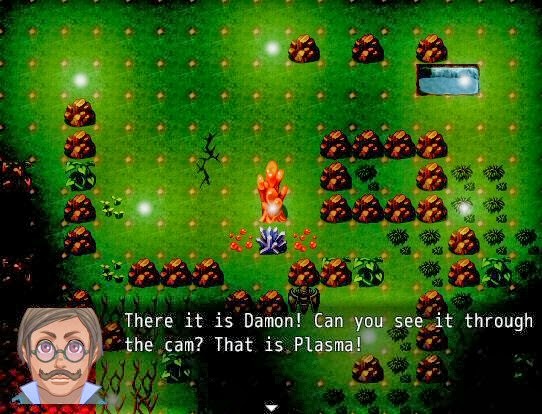 Hyper Blaster is all right as it’s good for huge swarms of enemies, but Rocket Launcher is practically useless most of the time as most enemies are fast and always in your face, so using an explosive weapon is a bad idea (not to mention its ammo is extremely scarce). Once again, as in the first game, we can choose to upgrade the weapons, but the upgrades are still the same ones (rate of fire, reload speed, and damage boost) and the effects of most of them are hardly noticeable. 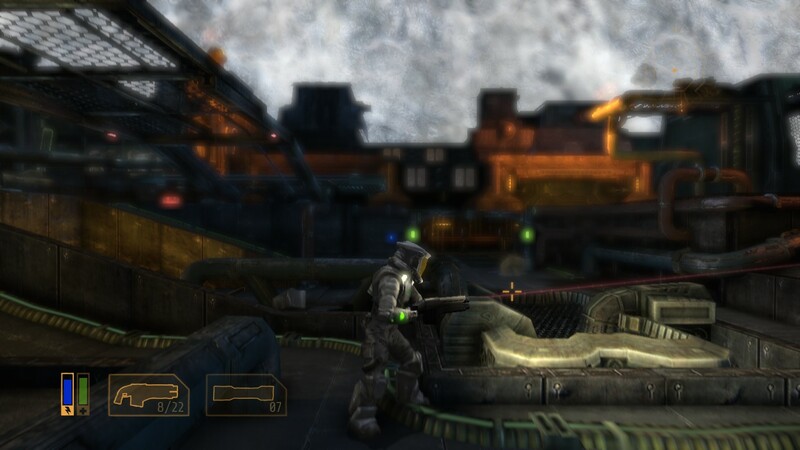 Perhaps the most annoying thing about this sequel though is the fact that in some areas the game takes a fixed camera angle and won’t let you rotate it, making it very hard to aim at the enemies, or to even see them on some occasions. I would understand that if the whole game was using fixed camera, but for a game that allows you to rotate your camera most of the time and then to take that choice away from you in some parts is just a pure design mistake. I know I went heavy on criticisms here, but this sequel still delivers a good amount of tension as the first game does, and at times you get really swarmed with enemies. It also does have some minor improvements over the first. They actually have some small cutscenes now, allowing us to see our character up close. 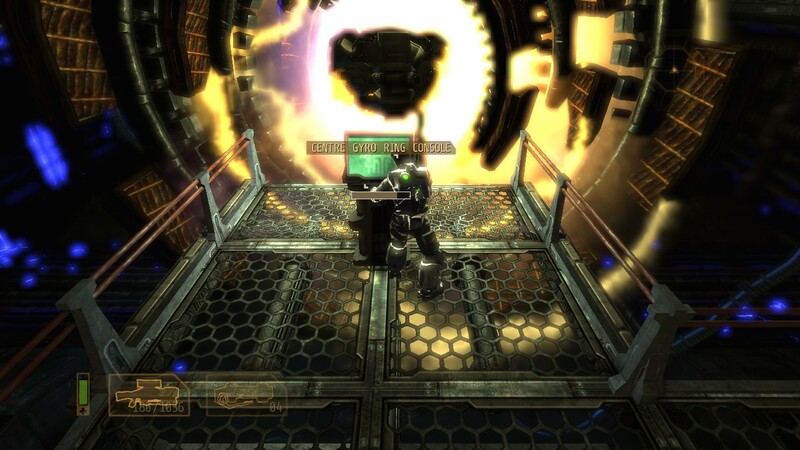 These mostly occur during boss fights, which I should say have been done quite well this time round. I personally quite enjoyed the Arachnomorph fight on the monorail. Overall this game is pretty much the same as the first, except with a few little annoyances like those sudden changes in camera angles, and also it’s slightly shorter, so my overall score will have to be a bit lower than the first. I think the series has seriously gone downhill. If the second game was more like Alien Breed 1.5, then the third game is pretty much like Alien Breed 1.5b. There have literally been no new additions to this third instalment. The only things that are different are either very trivial or are more of an annoyance than a feat. 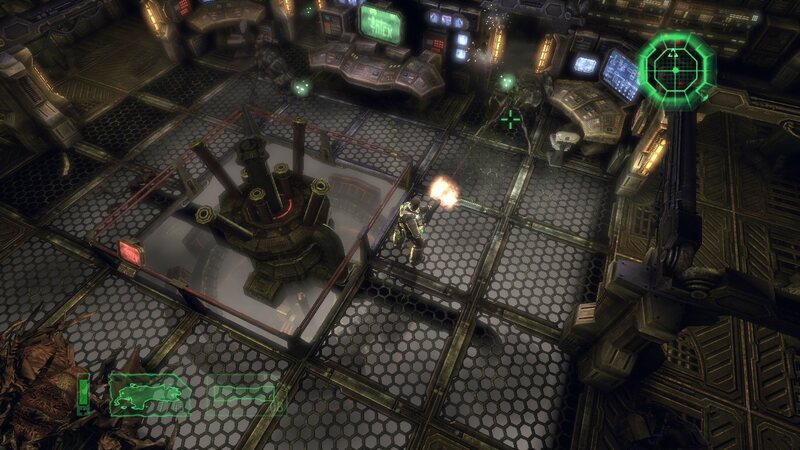 Just as the previous instalment, in this one some of the weapons have been changed around too. 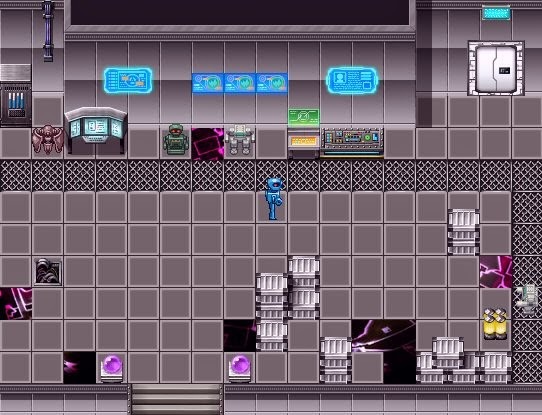 Once again, the first 3 weapons are the same, but for the last 2 now we’ve got an Electric Link Gun and a Project X. Electric Link Gun is fairly useful. 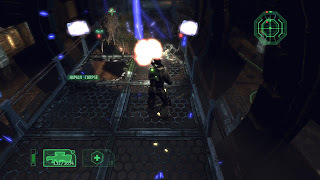 It fires electric projectiles, which upon connecting to the enemy paralyze them for a moment and then kill. Project X is not bad either, as it does large area damage. Despite these new weapons, I still found myself using the original 3 a lot more often, but it probably depends on the player. 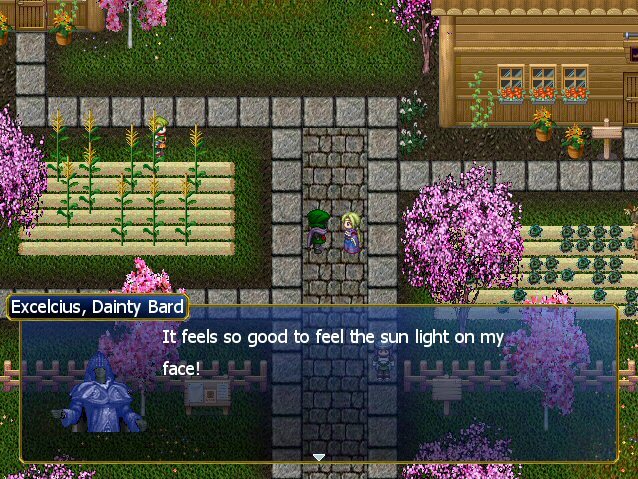 The game also tried to do a little bit of gimmicky stuff. In some areas the game takes a more over-the-shoulder perspective. Those parts are quite nice for eye-candy purposes as they break the norm and make you fight in a slightly different fashion. 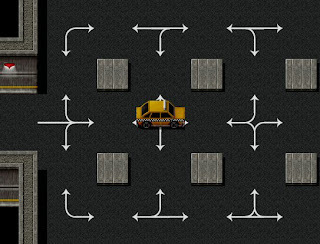 However, most of these parts tend to have fixed camera angles, and hence if you change direction, you often don’t see where you’re going. It’s still a nice addition, but I just wish it didn’t restrict you with fixed camera angles. Fixed camera parts were introduced in the second game, something I thought was one of the most annoying additions ever, and they still persist in this game. But what about the story? Well, it wasn’t exactly among strong points of the series up to now and it’s still not in this instalment either, as the player still walks through the same dark, semi-exploding corridors, from one part of the ship to another, activating computers and other systems. I would, however, point out that the main villain takes up a bit of a spotlight in this instalment and we get to find out a lot about him. In fact, I’d even say he becomes more likeable than our musclehead of a hero. Overall, Alien Breed 3 is literally identical to the first two. In fact the quality of the entire series has gone down in my eyes simply because of the fact that each new part was the same as the last. Even Steam achievements are identical in all 3 games. If you want to get maximum enjoyment out of this series, then I’d recommend you to play only one of the games and not all three. Any of them will do, though the first one is probably the best. 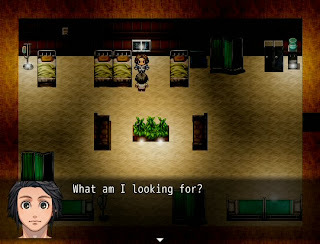 Labyrinthine Dreams is a short RM puzzle game about a girl named Beth who’s in a state of coma, all in a meantime internally reflecting on various tragic events of her past and attempting to find reason to stay alive. The struggles she goes through on a subconscious level are manifested in a form of various mazes and other puzzles, in which she must find a way out. I don’t usually tend to play many games of this style, but after having seen the trailer, I’ve been really curious to give it a try, and it didn’t disappoint at all. 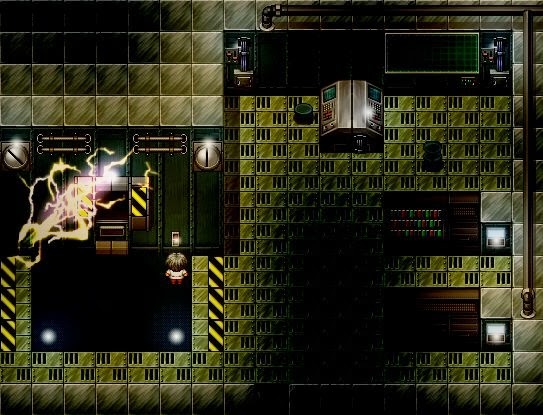 There is a rich variety of intriguing puzzles presented, ranging from forest mazes, to invisible paths in the skies, and many others, most of which you’ll have to think about carefully in order to solve. 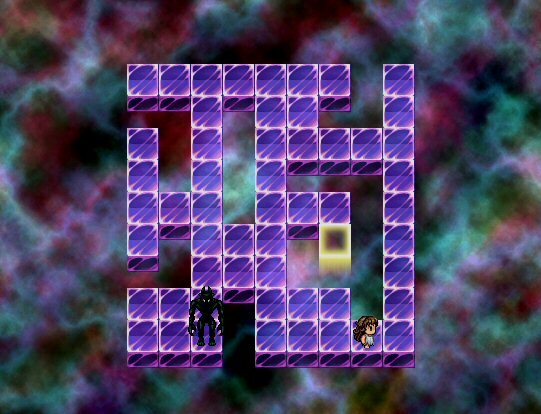 There is also a recurring puzzle that comes up several times in the game, in which Beth must outsmart what to me looks like a physical manifestation of death itself. For every one step that she makes, the monster can move two, each time coming closer and closer. The goal is to mislead the monster into dead ends, whilst at the same time to reach a way out of the maze. 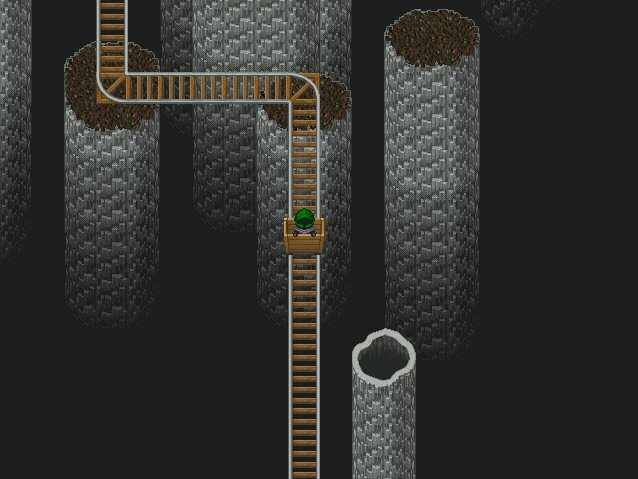 These are probably the hardest puzzles in the game, in particular the few near the end. They can be a little frustrating at times, but very often the solution is simpler than it may seem at first. Throughout the entire game there is a heavy melancholy atmosphere, which in my opinion has been executed really well, making us care for the main character and the events surrounding her within first few minutes of the game. 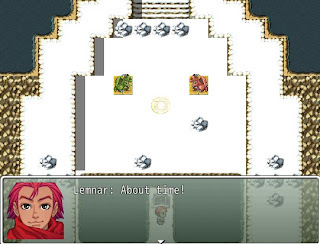 It’s an interesting combination to have a sad backstory of a character together with challenging puzzles, because I think as we play the game, we aren’t just solving puzzles and passing time, but actually sort of guiding the main character through their thoughts like some kind of guardian angel. The game might seem quite short and should only take about a couple of hours to get through, but after having played through it, I think the length is very appropriate and there’s quite a lot packed into it. So to conclude, I’m glad I’ve checked out this game, because the story has been well-written and the puzzles have been well-designed and very stimulating. 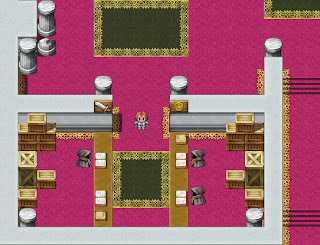 For more info on Labyrinthine Dreams and a download link check HERE. The first RM game I’m going to review is Dryantia. Set in an epic fantasy world where two elder races have been at a conflict with each other for millennia, which eventually resulted in a curse that’s killing the land and threatens the humans living on it. The curse is said to originate from a place known as the Earth Temple. 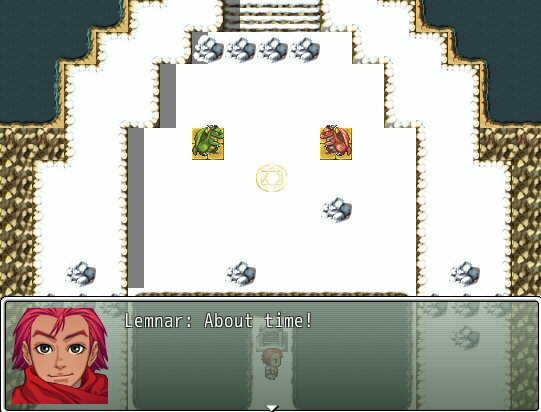 However, its exact location is unknown to everyone, and now a lone adventurer by the name of Lemnar is on a quest to find it. 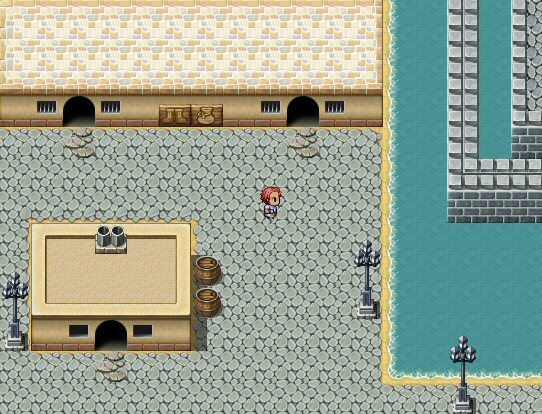 On first impressions, the game seems rather simple and utilises a lot of the standard RTP resources. 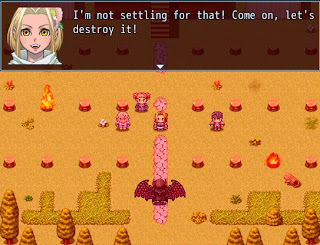 This could in some ways make it very similar to most other RM games out there. 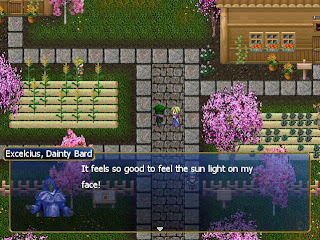 However, it does feature a very nice story and gets into it straight away, without making the player do any of the trivial quests. You acquire a couple of allies in the second town and then the game really picks up and more of the story is revealed in the parts that follow it, including a mysterious figure that could potentially be the main villain. The leading characters very quickly begin to bond with each other and there’s a definite chemistry between them as they crack various jokes every now and again. To top it off, they all play a necessary role in battles as they all possess different skills to each other. 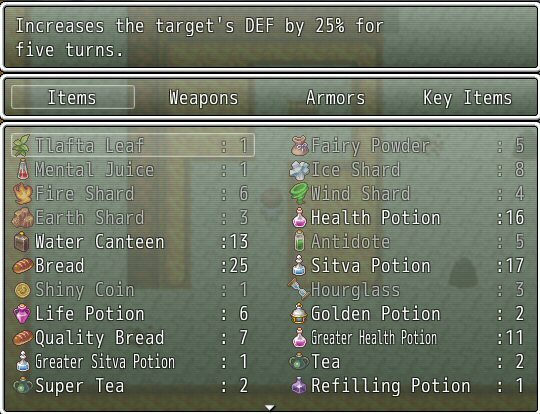 In addition, there are tonnes of different items that can be found throughout the adventure, some of which could in fact save you in a dire situation. 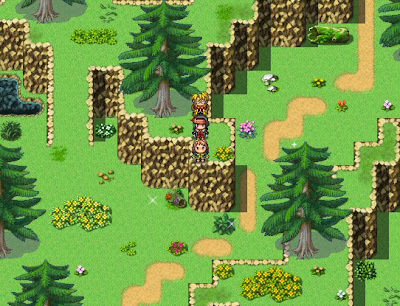 The game becomes a little hard and grind heavy in the middle parts and hence the pacing might seem to get slower. However, after a bit of that, it picks up again in the last third of the story and gets even better than it was in the beginning. 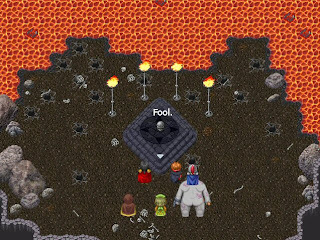 Apart from lots of fighting, the game also features plenty of clever puzzles, which are fun to solve, and some in fact might make you stop and think for a minute. And then there are also a few optional dungeons in the game too, which are very generous with their treasure, and if you get to the end of those dungeons, you would often be greeted with an optional boss. 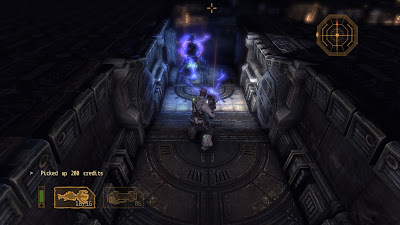 Overall the game has a good length to it of around 10 hours and leaves room for a sequel. There are still plenty of areas in the game that require some polish, and initial release version had a number of bugs in it, but the developer Winterfate has been very quick to fix them and so by now majority of them should be gone. 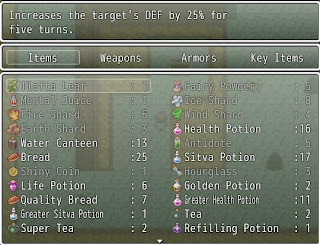 And so to conclude, Dryantia has been a fun experience. 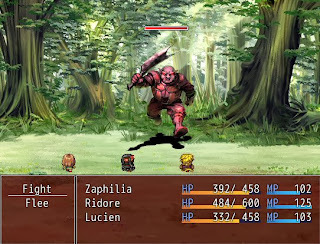 It might not be the most technically sumptuous RM game out there, but it has a solid base with its story and setting, which is then further enhanced with fun puzzles and flexible ways to strategise in battles. More info on Dryantia and the download links can be found HERE.